Tried the cinnamon keto fuel shake today for the first time and it was delicious! I added the water plus 2 tbsp of safflower oil and it came out great. Perfect amount of fat for my keto diet. I mixed it and let it sit in the fridge for 24 hours. I found, the longer left to sit, the thicker and better tasting it becomes. I even add a serving of lily’s dark chocolate chips (no sugar added) occasionally to give it a little something extra. They said it would arrive in 7-10 days but got to my house in 3. These guys are the real deal. My only question, if I get sick of the cinnamon, is there a way to change the flavor in my subscription? Or do I have to cancel this one and start a new one? I rarely write reviews, but had to give this product a thumbs up because it is well researched, executed, and done right. 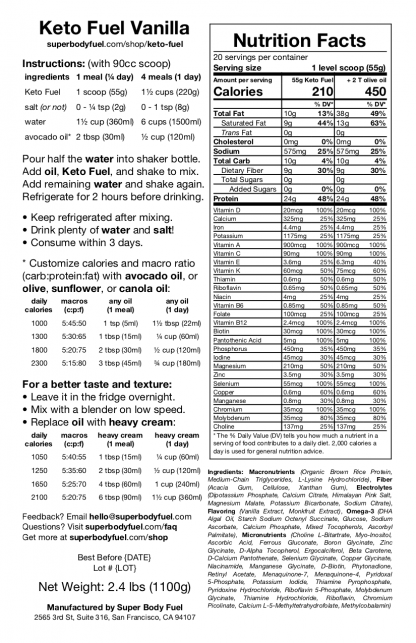 I was looking for a convenient way to do a keto cut without needing to prepare a lot of meals, and am using this for a full diet replacement (4 scoops a day). While in ketosis, and since October 26th (a little over 3 weeks now), I’ve lost about 15 pounds, and realistically about 7-8 pounds being water, and the other 8-9 pounds being fat. I currently also do 1-2 days of fasting a week where I also ensure I have broths supplemented with potassium, magnesium, sodium, calcium, some fish oil, and on the 5-6 days where I have my Keto shakes, I will intermittent fast until 12 PM, and close my eating window at 8 PM). I also drink a lot of seltzer water with lemon/lime and some ice cubes thrown in as ketosis is dehydrating. As my body fat goes down, I will eliminate the 1-2 day fasts. I subscribe to keto/paleo way of living, and Alex’s formula is spot on. 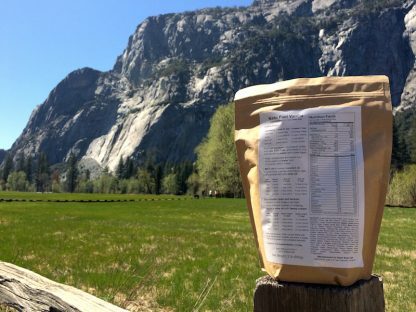 It has the right ratios of potassium to sodium (paleo-esque), FIBER, has MCT oil for immediate ketone production, and all the right amounts of electrolytes/minerals/vitamins/etc. It even has choline & magnesium in the right amounts. I feel secure in Alex’s formulation, and it’s evident he’s done his due diligence in creating a keto meal replacement drink, and know’s what he is doing. It also tastes good. I personally have been doing six bags a month which costs $270/month – I currently weigh around 192 pounds (down from 206 about 3 weeks ago), 6’0″, ~22% BF, and so the level of protein in this is proper for a keto weight loss. My target weight is around 165-170 pounds around 10% BF. The $270/month is a lot of money, or $67.50/week, but I am hardly eating out, or buying as many groceries, and eventually, once I reach my target body weight/composition, I can introduce cheaper more solid foods. This product is mainly for convenience, although if you wish, you could use this product in the long term without much ill effect, imho. I prefer using the heavy cream at 15 mL per scoop. 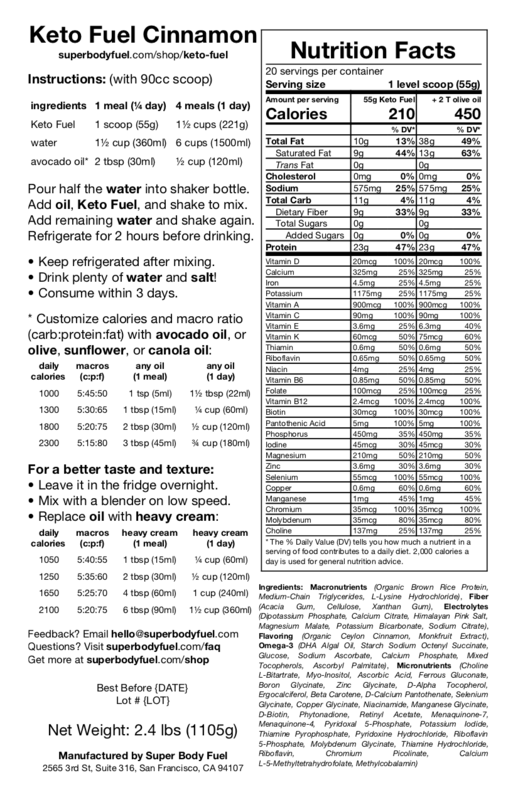 In total, I am doing 60mL of heavy cream per day for 4 scoops, and 1500 mL water, which is the 1050 calories he mentions on the nutrition label. 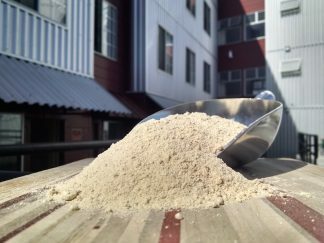 With all the fluid, and powders, it is a total of about 64-68 ounces of liquid, and is very filling. I have no hunger pangs when consuming this for an entire day. I haven’t done olive oil, but I would think heavy cream tastes better. Note: heavy cream has almost no lactose (only 3% lactose – so if you’re doing 60mL of heavy cream a day, it’s hardly anything). 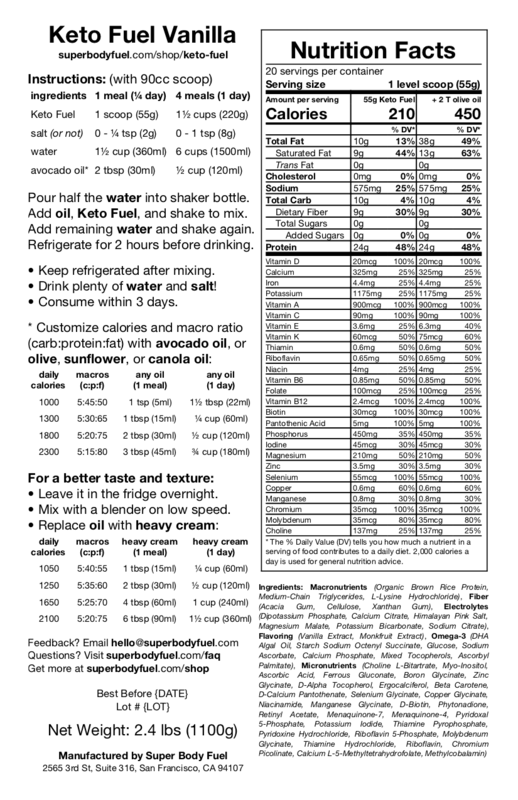 If you’re looking to do a full day meal replacement, this is it. I bought 6 bags/month (I personally do 2 cinnamon, 2 vanilla, and 2 chocolate). I personally enjoyed the chocolate the most – cinnamon, and vanilla are good too, and help give some variety. The cinnamon flavor isn’t too strong, and the vanilla doesn’t really taste like vanilla. I actually thought the vanilla was more of a mild chocolate if anything. Now: if you don’t have any peanut allergies, I recommend getting PBFit and throwing a tablespoon per scoop, and it makes the shakes taste heavenly. Also, it is important to ensure that you chill these drinks daily (around 8-10 hours) for maximum flavor, or it won’t taste as good. For entire day use – I also recommend getting stainless steel vacuum insulated containers. 2 32 oz HydroFlasks or Swig Savvy containers (which are cheaper but just as good imo). What I do is 2 scoops of powder say chocolate with 750 mL of water + 30 mL of heavy cream + 2 tablespoons of PBFit (50 cal), mix in blender, and pour in the steel bottle and cool overnight. I then also do another 2 scoops of a different flavor powder like vanilla with 750 ml water + 30 mL heavy cream + 2 tablespoon of PBFit (50 cal). 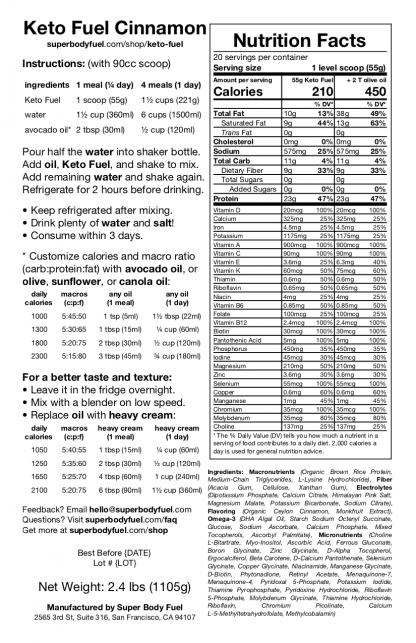 In total all 4 scoops with pbfit + total 60 mL of heavy cream is about 1150 calories per day. You could do a 64 oz stainless steel container rather than 2 32 oz ones, but then you’ll be doing one flavor for the entire day. What else? I hope they introduce more flavors like strawberry, “mocha”/coffee, banana, and so forth. 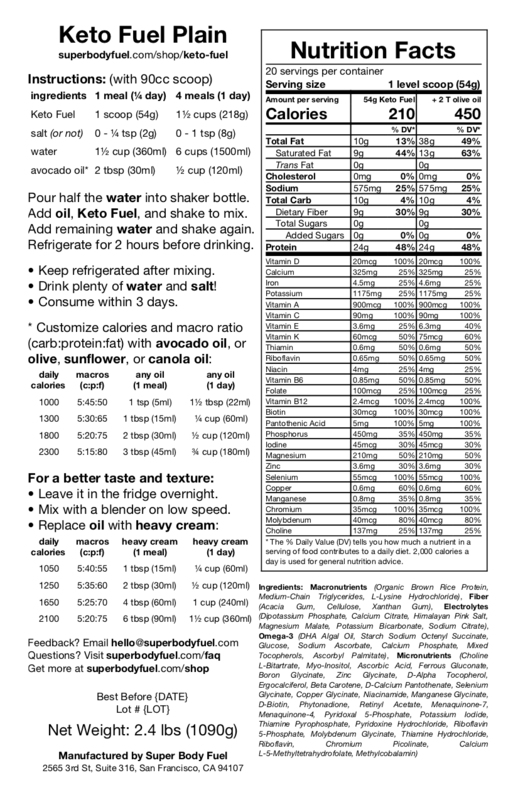 I think SuperBodyFuel/Alex’s formulation is better than KetoChow because it doesn’t taste “synthetic”/artificial-tasting flavoring – you know like Splenda. 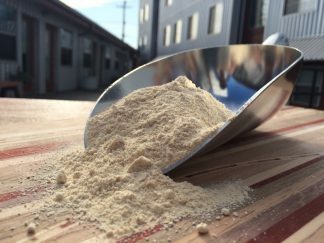 He uses a high quality rice protein concentrate which, of course, has no lactose, and imo, tastes better to me than whey protein, but YMMV. 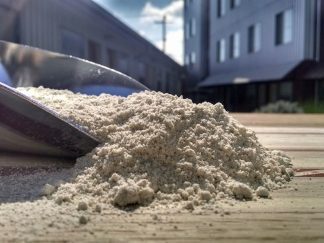 Rice protein has its pros and cons – it feels finer, softer, and better for people with whey sensitivities, but it has a slow absorption like casein protein. If you are a weight lifter doing something like KetoGains/ketosis, then some BCAA (5-6g) before your weight lifting might be useful. Also, it has MCT oil in it which, which is a huge plus, because if you do keto, know gets shunted to the liver directly for immediate ketone production that can be used for a mental boost by the brain (Source: https://en.wikipedia.org/wiki/Medium-chain_triglyceride#Medical_relevance). 1) Perhaps offer longer term bulk discounts say buying 3-6 months supply. 2) Consider selling on Amazon for 2 day shipping? 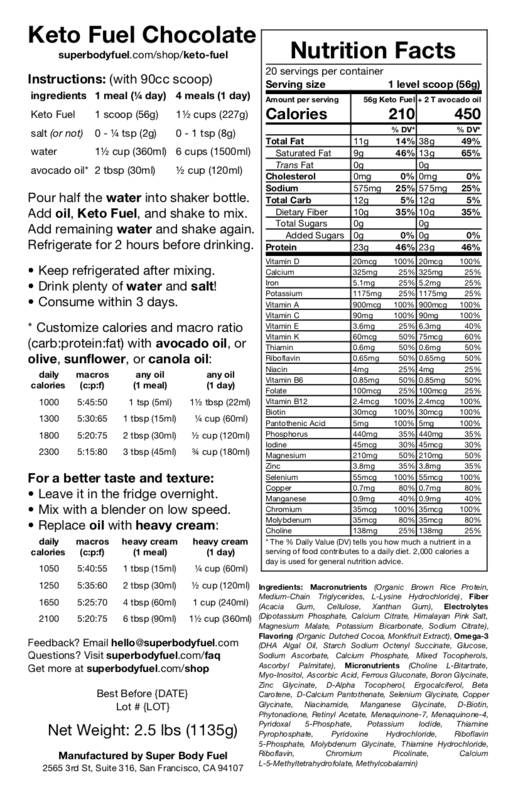 reddit.com/r/leangains/comments/1jlsfx/tldr_guide_of_31minutes_ama_pdf/) 2-3x a week to help maintain muscle mass while losing weight. You don’t have to exercise while cutting, but it does help maintain muscle while cutting. Err on the side of less rather than more to help prevent hunger cravings, and overtraining on a cut. Long-term use: On reddit, anecdotes have shown that long-term use is fine. See: https://www.reddit.com/r/soylent/comments/4dxgmu/blood_tests_before_and_after_a_year_of_100_keto . – I recommend getting a WiFi Withings scale to sync with your phone so you can check your progress on a daily/weekly basis, and can check on the website. – Get a before and after DEXA scan. IMO, as a male, you should keep cutting until you reach about 10% BF (if you are lifting), or at the very least 15% BF. Girls between 16-20% BF. It may cost you about $50-$120 for each scan, but it will be a worthwhile investment. The body fat calculators on weight scales are nice for progress, but aren’t entirely accurate. On keto, you will find that your body fat % is higher than it really is due to less water weight creating more resistance, and skewing your BF %. DEXA scan is the only practical to get an accurate reading. – Blood pressure was around 132/85 before going on keto (largely due to high sodium:potassium ratio), and now has been hovering around 120/80. I believe most of this, so far, is coming from water reduction from glycogen depletion, as well as the favorable potassium:sodium ratio (as well as magnesium) which all help keep blood pressure controlled. Keto Fuel is a acquired taste. Before they added the MCT oil it was kinda chalky, but chugging it down I was in ketosis in about 3 days. I opted to make every meal a Keto Fuel meal and that was a bad idea. It got to the point to where I would gag just trying to drink it. (I also think making it too thick might have added to that.) But now we get to the new Keto Fuel. New rice protein and potassium has given it new flavor, better tasting. I tried the Vanilla sample and it didn’t taste like vanilla to me. It was decent to say the least. But if you are looking for a substitute for a snack then this is it. Even if it’s once a day the stuff works and works well. 4/5 because of the taste. 5 stars if we can actually make it taste like cake batter. I have subscriptions for Vanilla and Chocolate. It’s cheap compared to most other low carb foods. The oils aren’t too expensive either. I opted for the MCT oil rather than coconut oil. It’s tasteless and I’ve heard great things about its benefits. Watch some YouTube videos on the differences to make your decision as to which of the two you’ll use. 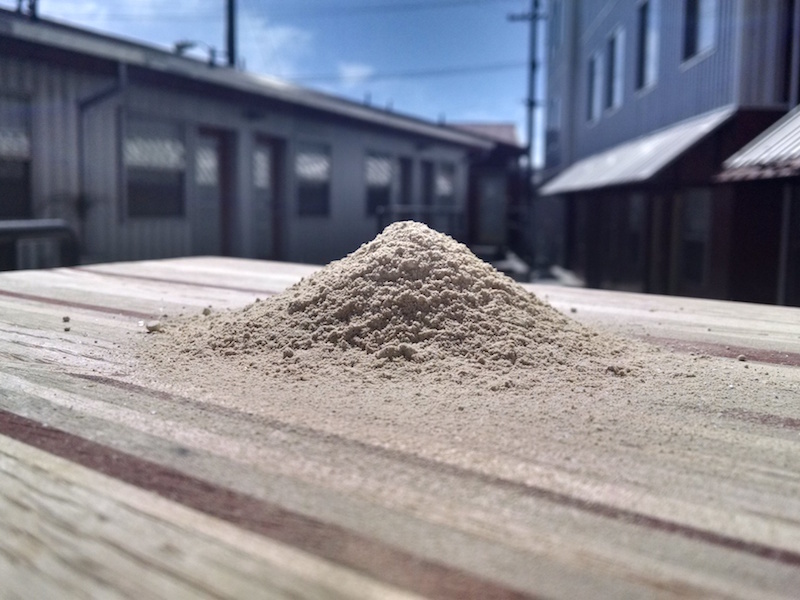 As far as this powder goes… it makes it a LOT easier to get started with a Ketosis diet. No meal planning and minimal prep involved. Just make a few shakes and stick them in the fridge. They’ll stay good for a couple days. The taste is fine. Sometimes I love it, sometimes I tolerate it. I make sure to switch it up and eat some low carb veggies every now and then to keep the flavor from getting monotonous. Though, I mostly stay busy enough that I don’t think about food after having a shake. I just never really get hungry anymore. – For ease of prep, pre-mix a bottle of Virgin Olive Oil and MCT Oil (or coconut oil) at a 2 to 1 ratio so all you have to do is pour out 3 Tbsp of the mixture. I dispense it like a bartender and count in my head to get approximately the right amount. I practiced this by marking a line on my containers at the 3 Tbsp mark, then trying many times. – When you crave something sweet, add a few drops of Stevia liquid or a packet of powder to a shake. I don’t believe this will affect your ketosis. – Buy Ketone urine test strips. You should see ketones after a few days. Then after a couple of months you won’t. This is because your body gets better at using the ketones, so it stops expelling them in your urine. You’ll need blood tests at that point if you’re curious whether you’re in ketosis. – Don’t drink your shakes too fast. They’re decently high in protein, so you can get gassy. Spreading them out by sipping will help give your body time to digest them so bacteria in your gut don’t eat the protein instead. – Don’t eat extra protein. This will prevent you from going into ketosis. You want your body to learn to break down fats. It won’t do this if you’re giving it a lot of protein. The 100g in 4 shakes sounds like the right amount, from what I’ve seen online and on YouTube. – Be prepared to feel crappy when you first start. A keto-cold is normal. Google it. Turns out I found some more Keto in the fridge I forgot to finish and it actually tasted good – turns out chilling the Keto is *very* important for good taste – simply using cold water is not enough. I was communicating with Alex and he stated they are going to try and improve the taste by trying out different sources of potassium and that chilling could possibly become less mandatory? We’ll see, I love how committed they are. I’ve been very happy with their other products just decided to try this one too since it doesn’t take milk (cheap option that doesn’t need to be refrigerated and can serve as my protein drink). I have been consuming Super Body Fuel Keto for the last 5 months and it’s great. I have been switching back and forth between chocolate and cinnamon and like both. The flavor and sweetness is mild and that is exactly how I like it. I got the vanilla flavor, it’s almost unbearably bad. Idk if I got a bad batch or something, but even with using heavy cream it tastes awful. This is coming from some one who has been drinking “Lents” for almost a year now. Schmilk is 100x better than Keto Fuel. I’ve been drinking Soylent for the past few months but after all of the issues they’ve had with quality control I decided to switch. So, I got the chocolate Keto Fuel and I have to say the first few drinks taste vile but it grows on you like cheap beer. On the plus side I feel full most of the day and it doesn’t clump as bad as Soylent. The chocolate is pretty great. The vanilla tastes even better, but it is ground too fine. Open the bag too fast and the resulting air current wafts the top layer of powder right out of the bag! That aside, both keep me satiated through the day. Highly recommend.